Raking Leaves Becomes a Family Affair Full of Fun! Raking leaves does not have to be a dreaded activity! Kids love to help with family chores. Provide each child with a child size rake and let the fun begin! Who can make the biggest pile in five minutes? Who can find the prettiest leaves to rake? Section off the yard and see who gets their section raked first. Then count to three and take a flying leap into your pile of leaves. 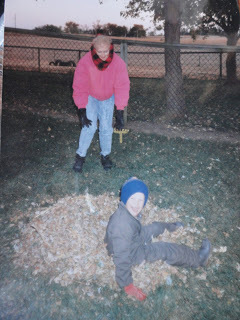 This is the best part of raking leaves… jumping and playing in the pile! Have a leaf tossing “fight”. Stuff white trash bags until full and round. Then decorate the outside of the bags. Why not make a catepillar for your yard? Can you think of other things to make with your “leaf balls”? Playing in leaves is an open-ended activity for all ages. Play for a few minutes or for hours! Fall leaf play is sure to provide lots of smiles, laughs and fun! Follow up the outside fun with a round of hot cocoa or hot cider. Save the prettiest leaves out of the piles to create pictures with them inside. Or, press your leaves between newspaper or in an old magazine. When dry, glue leaves onto poster board, then cover with clear contact paper to make Fall place mats.